The name Jüngerhans has for centuries been closely associated with maritime shipping. It can only be speculated as to the origin of the word "Jüngerhans". It is known that "Hans" in the Middle Ages was the most common form of the German name "Johannes". In addition, "Jung" indicates a nickname for the younger one in the family. The name "Jüngerhans" could have been created by combination. Master Heinrich Jungerhans (born 1615) is considered to be the progenitor of the Jüngerhans family at that time still without the German "Umlaut". 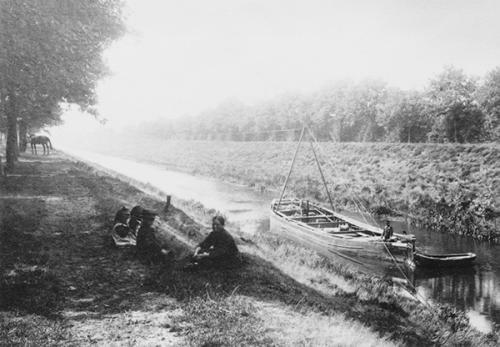 His successors turned towards the seafaring trade, as both his son Johann (born 1659) as well as his grandsons Joes (born 1687) and Hermann Joes (born 1693) became masters of the then customary Ems punt-boats that were still employed until the 1950s. The son of Joes Jungerhans, Hermanus Henricus (born 1733), continued the seafaring tradition and his sons Rudolph (born 1774) and Joannes (born 1777) are the fathers of the two lines of the Jüngerhans family - now with the"Umlaut". Joannes is the father of the 2nd line of the Jüngerhans family that continued maritime shipping. Rudolph, however, was the starting point of the equally successful line of craftsmen and merchants. Branches of this family can be found in the USA and in a larger number in The Netherlands.